Sometimes you don't need to read an old comic to be reminded of how awesome the past was. Sometimes an advert or product can do it all on it's lonesome. One subject in particular gives off such a great 'Marvel Vision', I rank it second only to Mike Zeck's cover to Secret Wars #1, in terms of doing so. Remember this from the 80's? The cover of this gamebook shared the same visual of it's comic book advert - but look who it included! All the cult icons are there, like Dr Strange and Silver Surfer, there's only one X-Man and all of the era's Fantastic Four! Try finding that in modern Marvel promotions! 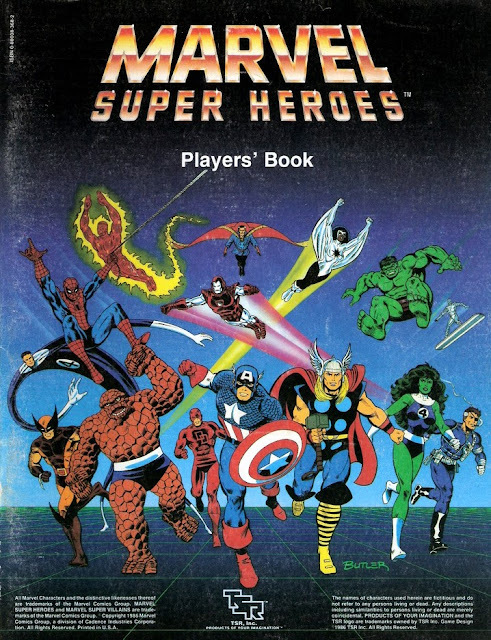 The game series featured companion books for everyone from the X-Men to Alpha Flight, however artist Jeffrey Butler really united Marvel's heroes as one on this cover. Heck, even Nick Fury and Daredevil got in on the action! 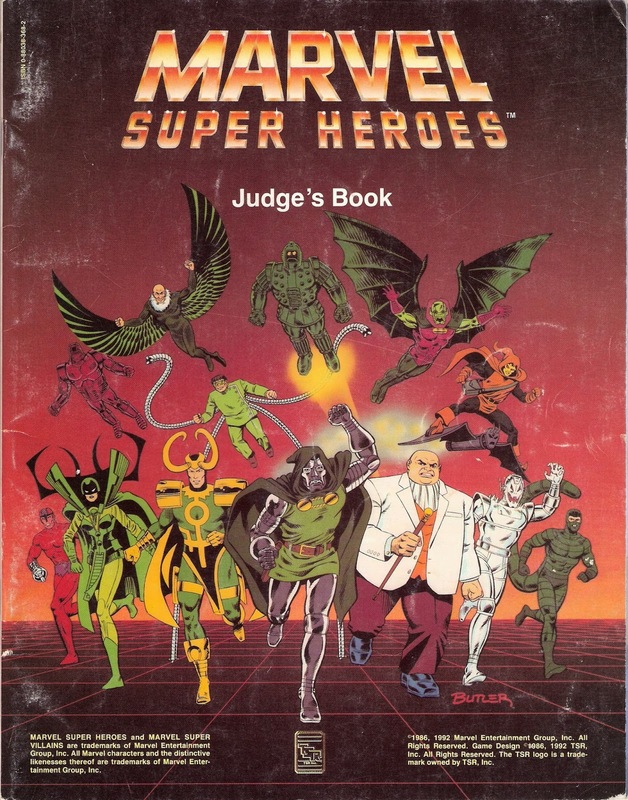 If you think that was diverse, the Judge's Book featured an even more off-beat selection of villains! No Kang, Green Goblin, Red Skull, Galactus or Magneto here, instead we have Dr Doom leading the charge, with Scorpion, Crimson Dynamo, Vulture and Hela. With Hobgoblin and Captain Marvel (Monica) in the skies of each, these gang shots maybe of promotions before marketing was a cut throat game, but as a guy employed in advertising by day, I can't really complain. All I know is this 'More Fun' era, sure is a warm feeling in the rear view mirror. These RPG books sure were hard to get ahold of - here in England they were next to impossible. Id have loved to get this one, if only for the FF references *sigh*. Back in 1994 I bought from abroad - cost me a ton - the LSH RPG Sourcebook, a fascinating tome that gave highly detailed background info on the book as it was at the time [during the Five Years Later period]. It proved most invaluable to me, and other LSH fans as it gave explanations to what was a complex book at the time, really exceptionally written. I don't think there was even an actual RPG game featuring them, but used it as background for the comic. Wow! That really is some "sweet as" art there. I don't remember seeing these myself, even though I was kinda aware of the gaming aspect due ot old ads in various comics. Those covers really were snapshots of the era, especially as you pointed out, a lack of an appearence by the X-Men. But oh look, who should show up but Wolverine. Very telling indeed. Thanks guys! Karl I was the same - these were hard enough to track without the different teams getting their own companion books. I'm a bit of a completeist by nature, and the fact that certain things never made it across the Pacific used to frustrate me no end! The other cool thing about the line-up Dale? The females. She-Hulk and Captain Marvel. Sure Black Widow could've gone in, but like you say, truly representative of the times. Plus Iron Man in the red and grey! Now that's something that is different.